I am particularly impressed by the text in Mycenaean Greek, which is easily rendered into Archaic Greek. 1 Decorated with spirals. The Minoans at Knossos and the Mycenaeans went crazy decorating many of their lovely frescoes and their walls with spirals. 2 Bathtub. You might be wondering, why on earth would I add this word?... because bathtubs were an integral part of room architecture, i.e. of the bathroom. The people of Knossos in particular were very clean. They even had an advanced hydraulics driven piping and drainage system, the likes of which was never again repeated until ancient Rome. And the Romans, unlike the Minoans at Knossos, made the terrible mistake of constructing their pipes of lead, leading to widespread lead poisoning. The Minoans used ceramics... nice and clean. Clever. No surprise there. 3 Mantles! Isn’t that what people wear? Well, yes, but they could also be used to decorate the top of windows, I imagine. Or maybe it is just my imagination. Correct me if I am wrong. 4 The word erepato, which  is the equivalent of the Homeric Greek elefantos never means ivory either in Mycenaean or in Homeric Greek! 5 Crocus? - of course! ... used all over the place in the lovely frescoes! 6 Circles were likewise universal on the building friezes. And with good reason. They are geometrically perfect, a typically Greek characteristic. Knossos building with perfect circular rosettes on its frieze! This building is remarkable for the typically Greek (or if you prefer, Minoan) simplicity of its architecture. What really struck me while I was visiting Knossos on the afternoon of May 2 2012 was that the circular rosettes on its frieze are perfectly circular, each one exactly identical to the next. It seems the Greeks inherited the mania for geometric simplicity fro their forbears, the Minoans. More photos follow in the next post. The First Ever KEYBOARD MAP for the Arcado-Cypriot TTF Font! This is the first time ever that anyone has posted the Keyboard Map or the Arcado-Cypriot TTF Font. As such, I reserve all rights for the map. If you wish to use this keyboard map, please feel free to do so, but since it is under international copyright, it is both illegal not to acknowledge the source, and ethical to acknowledge it. Since my copyright stamp is on the map, you will automatically be acknowledging it when you use it. However, anyone erasing the copyright restrictions will be subject to legal procedure. Please respect the work I have put into this map. 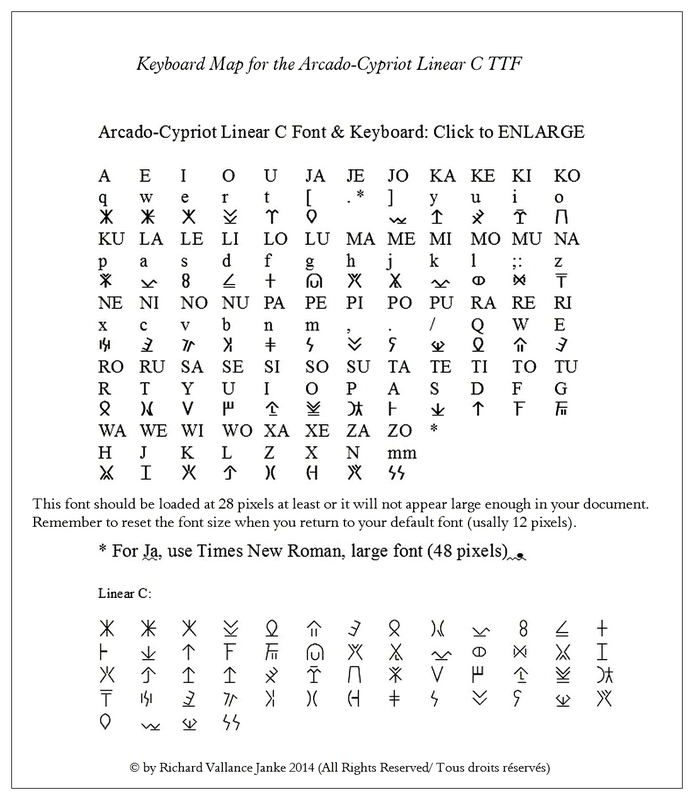 This month, I shall also release a Keyboard Map for both the Mycenaean Linear B & Arcado-Cypriot Linear C fonts, which will make the task of typing both fonts much easier for students and researchers of Mycenaean Linear B & Arcado-Cypriot Linear C.
Scroll down to the bottom of the page and click on the Linear C Font Chart. This is the only site where you can find the Linear C Font in TTF format. All other sites provide it in UNICODE format, which is incompatible with Windows.